How to apply Kalyana Lakshmi Pathakam (Scheme) Online Application Procedure: Government of Telangana has announced a novel scheme for the SC/ST girls called Kalyana Lakshmi Pathakam / this Scheme for SC/ST Brides. A one-time financial assistance of Rs 51,000 will be provided to the bride’s family at the time of marriage related expenses.A Telangana resident girl, over 18 years of age, belonging to SC or ST communities with a combined annual income of her parents not exceeding Rs 2 lakh is eligible for the Scheme. Here we provided complete details about this Kalyana Lakshmi Pathakam and also how to apply for this Scheme online, Telangana Kalyana Lakshmi Pathakam guidelines and details, KLP application Form etc. This is one of the best scheme introduced by Telangana Government it will be very helpful for all the SC/ST brides. Before applying Kalyana Lakshmi Scheme candidate must check for their eligibility for Kalyana Lakshmi Scheme . over 18 years of age belonging to SC or ST communities can get financial assistance of rupees 51000 ( Fifty One Thousand Rupees) . bride(Unmarried Girl) must have required certificates before they apply for the scheme. 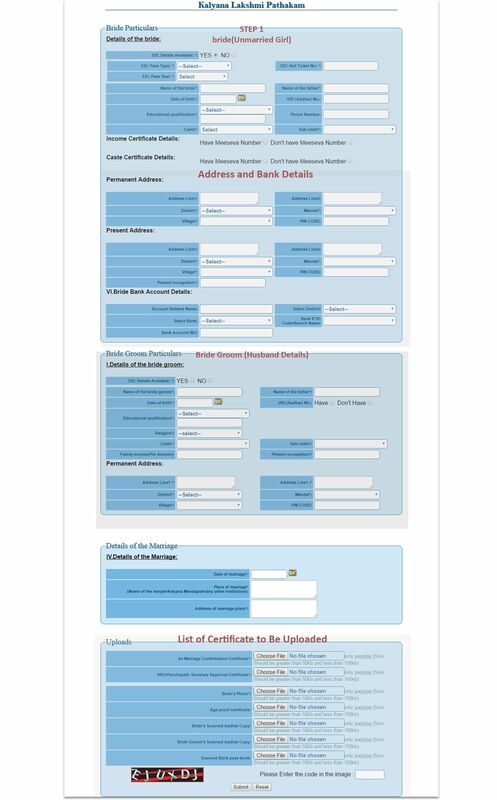 Start filling application form in Online, if bride(Unmarried Girl) have SSC (10th Class) certificate please select SSC details available option as “YES”.If you select “YES” for SSC you will find the three extra fields SSC Pass Year, SSC Pass Type and SSC hall ticket number. Fill the details and continue for next field Name of bride(Unmarried Girl). Fill the name of the bride(Unmarried Girl) Fill the other fields Name of the father of that Candidate and Date birth of bride(Unmarried Girl) and Aadhaar card number of that bride(Unmarried Girl). Fill the education qualification details and enter phone number, cast and sub cast. Then move to Income and caste certificate details. Fill Meeseva income certificate number details will be fetch automatically. Same as caste certificate if you enter number Meeseva certificate details will be fetch automatically. Coming to address section, enter permanent address of the bride(Unmarried Girl) .Select district, mandal and village .Next bank account information of the bride(Unmarried Girl) and enter bank account number and choose name of the Bank. Select district and enter IFSC code .If you don’t know your bank IFSC code, please visit concerned bank website and check. Now it’s time to fill the bride groom(Husband) details. Enter bride groom(Husband) details such as name, SSC details, Permanent address, Educational qualification, religion, caste, sub caste and Aadhaar number. Enter marriage details such as marriage date, place of marriage like kalyana mandapam or temple etc. Fill the address of the place where marriage took place. We need to upload some certificates in application form. All the required certificates are to be scanned with a size not below 50kb and not above 150 kb. Scanned documents should be in JPEG/JPG format only. Documents are as follow Upload all the documents above listed and get successful application form . For checking the status of your application in future keep this application safely .Hope this steps will help you . Upload all the documents above mentioned and get successful application form. For safety print out the application for future status checking purpose.